05.05.2015: Waaah! The videophone very recently got a major update! I built in a DVR board, so now I'm able to record its output wherever I want. I just started using this new feature and I realise how it is turning into a whole different beast! A mobile video glitch synth camera thing. I really need to find out how to battery power it soooooon! 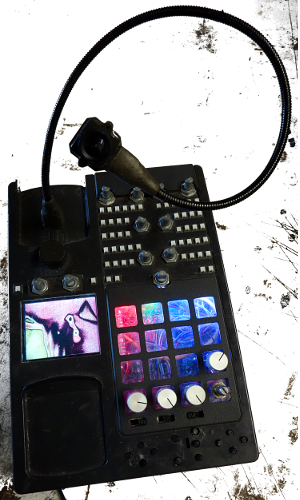 The videophone is a videosynthesizer and -effects unit that I started building around february 2012. I'd seen several projects online of people experimenting with VGA signals, such as the vfold video synth, or Sebastian Tomczak's VGA hackery. There's more examples around, but I can't remember them right now. I was looking for a way to expand my video setup, and this looked like an interesting way of going. Most of the projects online are based on the technique nicely explained in this pdf by Cracked Ray Tube. My entire setup is based on composite video though, so just hacking a cable wasn't an option. I don't remember if I came across Gijs Gieske's GVP1 first, or if I'd already come up with the idea of combinig two scan converters and then saw him beat me to it. As lots of his machines, it was definitely inspirational. 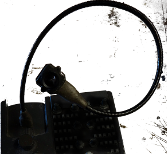 The heart of the videophone are two devices that convert video signals from compostite video to VGA and back respectively. In laymen's terms: one of them connects your DVD player to a computer screen, the other one lets you watch your computer's output on a TV. These devices can be obtained for very little money from a plethora of far eastern merchants of varying trustworthiness. At the same time, I started rehousing a SNES into a white telephone shell (currently another halfway done project on the ever growing pile...), And coincidentally came across another phone of the same type, only in black. So I thought they would be nice companions. It was not until I started poking around on the circuit boards that I realised the vast potential this setup would have. In addition to the effects that could be achieved with hacking the VGA lines, there also were around 25 bends on each of the scan converters. This also meant that I spent a considerable amount of time thinking how to build a suitable interface, and how to integrate it into the already existing design of the phone. 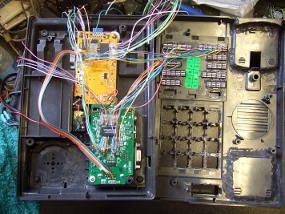 Here we have a nice picture of the videophone's guts at a very early stage. Some of the bends are already in place, others still need to be connected. the green circuit board converts the composite video signal to VGA. Let's call this the 'input stage', the yellow one converts from VGA back to composite. Here's our 'output stage'. Bear with me, it's only going to get more confusing from here. The architecture of both pcb's is very similar, they use the same Ram chips. Any of the effects that can be created on one of them has an equivalent on the other one. The glitches aren't identical, but close enough for considering a symmetrical interface. I usually develop an instrument while I build it. I also like working with shells that already bring a design of their own that I can work my way around. The reason I picked this telephone was that it came with quite a few elements that I could integrate my interface in. There is still space left and there are still quite a few things I will build into it, but all in due time. This is where the video enters the System. There's a switch for choosing between three available sources: external input, camera, and internal feedback. The external input is pretty self-explanatory, I guess. 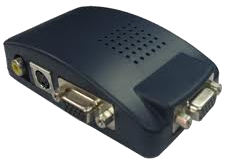 Any composite video source can be connected, be it a DVD player, or hrough another converter, a computer. The camera is a cheap cctv camera that I got a wide angle lens for. The focus can be changed manually by screwing the lens in and out. The gooseneck fitting has USB plugs on each end, so the whole arrangement can be taken apart for transport. This system allows for the later addition of different camera modules in the future. The internal feedback is exactly what you'd expect it to be. The video output gets fed back into the input. This allows for the creation of psychedelically fluid, "alive" pictures. The section in the upper right corner. The holes for the speed dial buttons just had to be widened a bit to accommodate my tiny switches. The whole matrix is divided into two groups, one for the input, one for the output. Each of the groups contain several blocks, grouping similar effects. These blocks are connected to each other through a network of pots. Each switch connects to a pin of the scan converters' ram chips. I designed the interface to achieve a maximum of complexity while still having an intuitve layout. I always find it a bit troubling to explain it to people so they actually understand it, but as soon as they start playing around with it, they get it. I might draw a schematic some time, until then, you'll have to use your imagination. This section is to manipulate the vga signal which is present in between the two converters. Right now, it still pretty basic and will hopefully see some more options soon (as you can see, there's still quite a lot of space left). The pots let you fade out the red, green, and blue channels respectively. The switches under the pots can be used to switch each channel to another one. I am planning some automation options for the channel fades, probably a dedicated LFO for each channel. A control for channel inversion would also be nice. Also, there are lots of possibilites of how to inject other signals into the colour channels to create all sorts of effects. This will add a whole new layer of very different aesthetics to the video stream and really needs to be done soon! An unassuming assortement of buttons in the lower right corner. With these, the scan converters' internal menus can be activated and navigated. Here, you can influence settings like brighness, contrast, horizontal and vertical scale, etc. Also, there are buttons that allow you to position the picture and change the input resolution. There are two digital zoom modes, one of which I found as an unpopulated terminal on the circuit board. These controls add a lot of possibilities of picture manipulation. The menus pop up on top of the picture, so they are also visible in the output stream. I've gotten used to treating them as another element of the picture rather than a nuisance. The screen was the latest addition to the System. While being very practical, it also adds some super extra sexiness to the overall look. Currently, it only shows the output stream after all the effects, but at some point I'll probably make it switchable to preview any of the source inputs as well. It has controls for brightness and saturation, and there's a switch to mirror the image. Amazing work!!! I was introced to feedbacks back in 2006 in Porto, Portugal. An artist friend of mine Pedro Pinheiro from www.piss-off-art.com. Do you sell them? I'm a musician and would be interested for live performances. Pura Vida!